A common managerial belief indicates that brand loyalty declines over the years, with consumers becoming more heterogeneous in their choices. 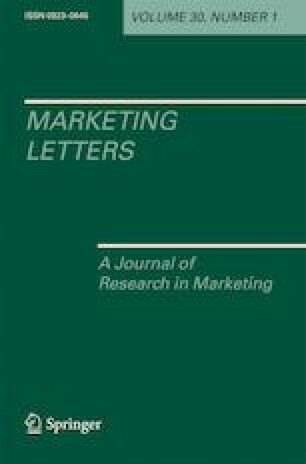 The earlier research investigating the phenomenon of brand loyalty decline is, however, inconclusive and does not offer an answer to the reasons behind brand loyalty evolution. In this study, we investigate brand loyalty evolution and explore the impact that a number of category characteristics have on driving brand loyalty evolution. We use Danish panel data across 54 categories over a period of 6 years (2006–2011). Our findings show that at the aggregate level, brand loyalty declines, but this evolution is category-specific, with only a small number of categories showing a significant decline. We further demonstrate that an increase in category penetration results in a negative impact on brand loyalty evolution, whereas an increase in the share of private label brands has a positive impact. We discuss the implications for theory and practice. The authors wish to thank GfK Denmark for granting access to the data used in this study. This research was supported in part by the Danish Council for Strategic Research under grant 2101-09-044, “Bridging the gap between health motivation and food choice behavior: A cognitive approach” (HEALTHCOG). Kusek, K. (2016). The death of brand loyalty: Cultural shifts mean it's gone forever [online]. www.forbes.com. Available: https://www.forbes.com/sites/kathleenkusek/2016/07/25/the-death-of-brand-loyalty-cultural-shifts-mean-its-gone-forever/#b44a1b4ddec5 [Accessed 28 June 2018. Nielsen. (2011). Global private label report - the rise of the value-conscious shopper [Online]. Available: http://www.nielsen.com/us/en/insights/news/2011/global-private-label-report-the-rise-of-the-value-conscious-shopper.html [Accessed 10 October 2017]. Nielsen. (2014). The State of Private Label Around the World [Online]. Available: http://www.nielsen.com/be/en/insights/reports/2014/the-state-of-private-label-around-the-world.html [Accessed 10 October 2017]. USDA. (2010). New product introductions of consumer packaged goods, 1992–2010 [online]. Available: http://www.ers.usda.gov/topics/food-markets-prices/processing-marketing/new-products.aspx [Accessed 7 July 2015].